When conducting analysis with the Nexera UC supercritical fluid chromatography system, because diffusion of the sample band in the mobile phase is high compared with liquid chromatography, separation behavior changes significantly depending on the types of columns used. Shim-pack UC-X series was designed with a variety of stationary phases, making it suitable for analysis of various compounds. Shim-pack UC-X series offers various stationary phases suitable for the mobile phase of high diffusion and low-viscosity liquid carbon dioxide. Analysis time can be reduced at a high flow rate without impairing the separation performance. In addition, analysis speed, which is limited in HPLC, can be increased. Shim-pack UC-X series was designed with eight types of stationary phases and sizes to meet diverse research and development needs. Shim-pack UC-X series achieves high inertness for improved analysis precision and increased column durability. Its uniform silica surface and stable chemical modification also ensure high analysis reproducibility. Isomers and structurally similar compounds that are difficult to separate can be analyzed by Nexera UC and Shim-pack UC series at high speed. 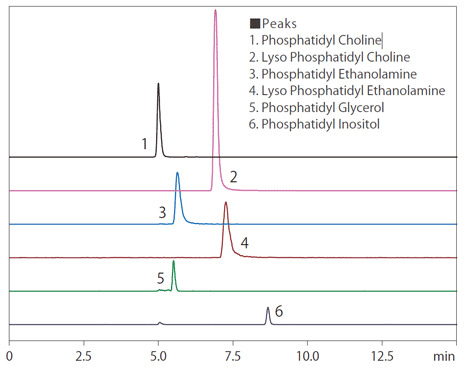 In this example, four kinds of tocopherol isomers were analyzed by Nexera UC and Shim-pack UC Sil. 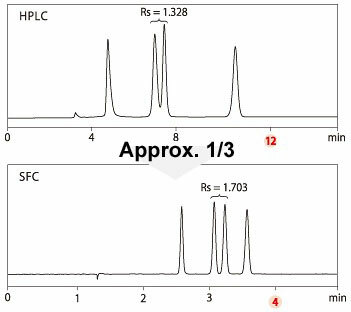 As indicated on the right, analysis time was reduced to one-third the time achieved with conventional HPLC method while resolution was improved. The example on the left shows the result of the analysis of phospholipid classes using Shim-pack UC-X Diol with Nexera UC. The ODS-based Shim-pack UC-X GIS II can also be used to analyze molecular species of phospholipids with the same modifiers. Nexera UC and Shim-pack UC-X series are ideal for analyzing complex samples. Simultaneous analysis of multiple pesticides with a wide polarity range from hydrophobic to hydrophilic ones has been achieved using the Nexera UC using Shim-pack UC-X RP. Shim-pack UCX-RP contains a polar functional group embedded between the silica surface and the C18 group. 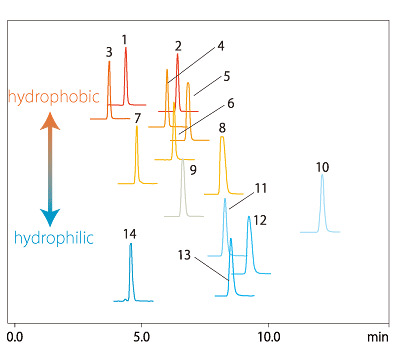 This allows the column to analyze a wide range of components from hydrophobic to hydrophilic ones. Simultaneous analysis of multiple components can now be performed more efficiently using the Nexera UC and Shim-pack UC-X series.